Not only is it healthy to take some vacation days and get the whole family away from their screens; it’s also easy to find snow activities to do together, regardless of age, ability level or budget. With our annual FUN IN THE SNOW guide – in partnership with The Family Travel Forum — you’ll see how easy it is to book a value winter vacation coated with memories to keep you warm. Where were you during winter storm Bruce, which disrupted Midwest travel throughout the Thanksgiving weekend? If you’re traveling during the winter holidays or planning a ski trip, Allianz ski travel insurance can reimburse you for costs (think flights, hotels, lost baggage, rental gear and lift tickets) if your travel is delayed, changed, interrupted or canceled for a covered reason, such as unforeseen severe weather. (Note that once a storm is recognized and named, claims are not covered.) It also provides peace of mind with emergency medical and dental benefits, plus emergency medical transportation. While most policies won’t cover participation in extreme sports, a basic family travel insurance policy is a must. No matter how you fly, it’s always best to be covered with travel insurance! In terms of ski and snowboard gear, let us share some wisdom. As critical as your gear is, most of it can be rented. If you prefer to travel with your own, keep in mind that expert families usually carry their customized boots and rent the latest model performance skis or snowboards on arrival. For the ultimate convenience, Ski Butlers delivers all your ski and snowboard equipment rentals directly to your accommodations at 47 Resorts in Colorado, Utah, Wyoming, Idaho, Montana, California, British Columbia Canada and France., fitting you and your family right there—no need to wait in line at a rental shop! The company will swap out your equipment, meaning if you have any issues with your gear, would like to try a new ski or boot, etc they will meet you within 45 minutes of a phone call at the resort. At the end of the rental, they pick everything up after your final ski day, Kids rent free in Telluride, Steamboat and Sun Valley with a matching adult package. There are lots of opportunities for moms and grandmas to learn with friends or just hone their skills at women’s ski clinics around the country. At the same time, a growing number of resorts are offering scheduled women-only classes -— a great way to spend a stress-free few hours. BEAVER CREEK, Colorado is a favorite of well-heeled families because it’s smaller than Vail, while offering that resort’s first-class service and terrific ski school. Families appreciate extra little touches such as fresh-baked cookies served daily at 3pm throughout the pedestrian base village, and at the base of Centennial Express and Haymeadow Express Gondola (#1) – the dedicated children’s ski school gondola serving the learning area. In addition to on-site ice skating, casual dining options, and fireworks, families will enjoy the vintage Ice Cream Parlour located at The Ranch where kids and adults alike can delight in sweet treats and house-made hot chocolate. Families will find terrific spas at the Beaver Creek hotels (the Park Hyatt Beaver Creek and the Ritz Carlton Bachelor Gulch) and can opt up to join the private White Carpet Club, a concierge-led lounge with snacks and ski lockers. Offered on Tuesday and Wednesday evenings each week, and select Saturday evenings during the season, Allie’s Cabin Family Dinners welcome guests to savor gourmet fare which caters exclusively to children and families. Guests are whisked to the cabin via an open-air sleigh, welcomed with cozy lodge slippers, and treated to a three-course dinner or a children’s buffet (for children 12 and under), by a floor-to-ceiling stone fireplace. There’s extra family programming to celebrate the holiday spirit during Beaver Creek Extraordinaire presents Cheer (Dec. 22, 2018 – Jan. 5, 2019). Our visit chronicled here. BIG SKY RESORT merged with nearby Moonlight Basin Montana to offer one of the biggest ski and ride terrains in the US and, by grooming more glades, they now offer 5,800 skiable acres and endless ways to navigate 4,350 feet of vertical drop with rarely another skier in sight. Runs up to 6 miles long, glades and bowls, seven terrain parks ranging from novice to big air, all covered in 400+ inches of annual snowfall make a day on the slopes something different for everyone. Off slope adventures suited to teens include a giant swing, bungee trampoline, climbing wall and nearby, some night tubing, guided snowshoes tours, a challenging high ropes course and zipline tours. Not too far from the resort, families can snowmobile or snowcoach through Yellowstone National Park (read about our visit in to Yellowstone in Winter here), try Nordic skiing or horse-drawn sleigh rides through Lone Mountain Ranch, and test their skills at winter fly fishing, rock and ice climbing throughout the Gallatin Valley. BRECKENRIDGE SKI RESORT is set in the middle of a historic Colorado town of the same name, where heated sidewalks make it easy to stroll for hours past more than 200 restaurants, shops and après ski hangouts. Around the town are off-slope activities such as dogsledding, winter zip lining and larger-than-life snow sculptures during the annual International Snow Sculpture Championships (Jan. 21-30, 2019). Over the past five years the resort has made major on-mountain investments across all Five Peaks, from the addition of more than 500 acres with the opening of Peak 6 in 2013 to the opening of an upgraded 6-passenger Falcon SuperChair on Peak 10 just last season. Guests with a sweet tooth will welcome the Candy Corner to Breck’s Ten Mile Station, offering an array of your favorite chocolates and sweets. What else we love about Breck on or off the slopes can be read here. KEYSTONE RESORT, recognized as a top family resort destination, is located in Summit County, Colorado and just 75 miles from Denver. Families find more than 3,000 acres of skiable terrain including three peaks, five above-tree-line bowls, night skiing and an in-bounds cat skiing program. Home to the industry’s leading Kids Ski Free offer, kids 12 and younger can ski and ride for free all season long with just two or more nights of lodging booked through the resort, no blackout dates. New this season, Keystone Resort lodging guests can receive exclusive early lift access one full hour before the lifts open, granting them first dibs to the slopes. Keystone’s signature Kidtopia programming elevates any visit with a variety of free, daily family offerings throughout the winter season, such as arts and crafts events, scavenger hunts, a parade and fireworks, and the world’s largest Snow Fort. 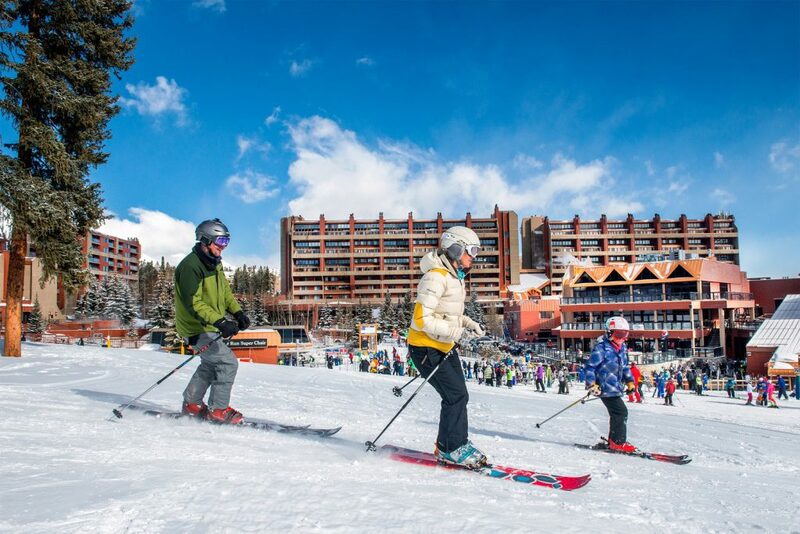 We love the free designated family parking and complimentary red wagons to help parents tote gear (and excited kiddos) to and from the slopes, because they really help make a winter family visit to Keystone easy and hassle-free. Kidtopia also offers a kids’ culinary experience, which you can read about here. BACHELOR is 20 miles west of the very hip town of Bend, Oregon and, with 4,318 acres of skiable terrain, is the 6th largest ski and snowboard area in the United States. Mt. Bachelor’s newest chairlift, Cloudchaser, opened in December 2016, adding 635 acres of new terrain and 14 new runs across the mountain’s weather-protected east side. As the tallest in the Cascades with a lift-served summit of 9,068 feet, Mt. Bachelor receives an average of 462 inches of light, dry powder each year, creating among the most reliable snow packs in North America. Moreover, the snow riding season typically lasts from Thanksgiving through Memorial Day weekend. More to read about Mt. Bachelor here. The Pennsylvania Ski Areas Association Snowpass program provides every fourth and fifth grader the opportunity to ski or snowboard for free, up to three times at 21 participating Pennsylvania area ski resorts, when accompanied by a paying adult. SMUGGLERS’ NOTCH (known to locals as “Smuggs”) in northern Vermont is Ski Magazine’s pick for families in the northeast, because it’s known for its award-winning children’s facilities (including infant care) and off-the-slope activities including a zip line canopy tour. Snow Sport University provides expert instruction for children and adults in skiing, snowboarding, and snowshoeing with 1,000 acres of all terrain access across three mountains. Conveniently located on the Green in the center of the resort Village, a new learning area for children ages 3-6 will accelerate skills development with sculpted snow features like a 100-foot mini halfpipe, rollers, banked turns and obstacle courses in a Burton Riglet Park for young snowboarders. Club Smugglers’ ski and stay packages include lift tickets, lodging, access to the brand new FunZone 2.0, use of the indoor pool and hot tubs, cross country and snowshoe gear, daytime and evening tubing and more and, during the weeks of Dec. 16-21, Jan. 13-18, Feb. 3-8, and March 3-8, any guest who has booked a Club Smugglers’ package will be offered free lessons and rentals for kids 12 and under! The Winter Experience package that includes a variety of indoor and outdoor activities is ideal for families seeking a winter wonderland experience without skiing or snowboarding. More to read about winter deals at Smuggs here. TAOS SKI VALLEY recently voted USA Today’s Readers’ Best Ski Town and home to one of North America’s highest lifts, is the best known among New Mexico’s eight alpine and three Nordic ski areas. Altitude assures it is typically blanketed with 300 inches of snow each season. In recent years, new owners have greatly upgraded its facilities, on-mountain experience and four season offerings, starting with The Blake, a stylish 80-room hotel at the base area, and a new state-of-the-art Children’s Center that makes skiing with kids easier than ever. As the only B Corp ski resort in the world, Taos is leading the entire skiing community with its commitment to sustainability, local and fair economic development, and social justice. More about Taos’ makeover here. First of all thanks a lot for sharing this wonderful information. Actually, I’m planning to go on a ski holiday this year with my family and I must say this is really great as well as helpful info for me. Thanks for sharing.